ISSN: 1531-6505; Issue 46 - Subscribe Free! SCOTT'S NOTES - Topics for Future Issues of DigiFreq? What would like to see covered in future issues of the DigiFreq newsletter? That is the question. Don't worry... I haven't run out of ideas. I just want to hear your opinions and find out the kinds of content that you enjoy the most. Please post your answers in the following special topic on the DigiFreq Forums: http://www.digifreq.com/digifreq/discuss/topic.asp?TOPIC_ID=7352. Don't have a forum account? No problem. Just sign up for a free account at: http://www.digifreq.com/digifreq/discuss/policy.asp. Thanks and I hope to see you there! We've got some great info in this issue including a feature article covering some guitar recording techniques. We've also got some news announcements from Best Service, Precisionsound, eMedia Music, Groove Monkee, Focal Press, Ueberschall, Drums On Demand, and Toontrack. We've also got some great discussions going on in the DigiFreq Forums. Plus, a great free fx plug-in pack software download, as well as some great Cakewalk SONAR tips (including a new video). In the last issue, I gave some special thanks to all the readers who had posted reviews of my SONAR X2 Power! book. Since then some more reviews have come in and of course, I want to say thanks to those folks as well. Thanks to: Dennis Timlin, Raymond Pace, GJH, Ricki Vaneman, Jaime Moreno, JX, J. Bowles "Jbow", David H. Bailey, Michael Parson-McNamara, Peter Milham, Ian Myers, and A. D. Scotchman. If I missed anyone, let me know. Thanks very much, everyone! I really appreciate your support. And if you have the time, please keep those great reviews coming... If you have already purchased SONAR X2 Power! and would like to post a review on Amazon, please visit the Power Books site and click on the SONAR X2 Power! link. Then click one of the order purchase links to get to the Amazon book page. Once there, scroll down to Customer Reviews and click the Create Your Own Review button. Thanks! Thanks so much for reading DigiFreq! Now lets kick off this issue with some guitar recording tips... Enjoy! Written by Brian Tarquin - © 2012, Cengage Learning. Reprinted with Permission. When I was a kid growing up in New York, I remember that my dad had an old 1/4-inch four-track Grundig reel-to-reel tape recorder that was great for recording multiple guitar parts. I always thought it was so cool to sit in that sunroom and be able to hear the tracks played back, and to physically cut and edit the parts with a razorblade and edit block. Today we have it so much easier. Whether you use a PC or Mac and any of the many programs out there, such as Cakewalk, Logic, Performer, or Pro Tools, editing has become a breeze. But the one true thing that has stayed constant throughout the years is recording great guitar tone. Van Halen's first engineer, Donn Landee, used to get approached by fans asking him how he recorded Eddie's trademark guitar tone. He had to admit that he used a cheap SM 57 mic on a Marshall cabinet. As some of you readers may know, the Shure 57 is a basic $89 mic that you can purchase at any local music store. This proves that you can get great tone without breaking the bank. What you need to understand are the various dynamics that come from both the guitar and the amp. For instance, when playing a Les Paul through a Marshall JCM800, you get a very compressed, overdriven rock tone as opposed to playing a Strat through a Fender Super Reverb, which produces a more dynamic blues tone. Both can be recorded successfully with an SM 57, but if you want to spend a little bit more cash, you can buy what I refer to as a "57 on steroids," the Sennheiser 421 mic. If you have more of a budget and you want to capture the sound of your amp in the room, you may want to try the Neumann TLM 103 or the more expensive TLM 49, which are both large-diaphragm cardioid microphones. The large diaphragm of the mic will capture the ambience of the room. In particular, the TLM 49 has a wonderful airiness to its recordings. By comparison, the 57 has a very small mic diaphragm, which is more beneficial for unidirectional close miking. I'm sure some of you have heard the buzz about ribbon microphones—and yes, it is true that in some recording applications of guitars, the ribbon mic is perfect for acoustic instrument replication. The Rolls Royce of ribbon mics is the Royer 121 or the famous Beatles BBC 4038. However, you can always go with the less expensive Beyerdynamic M160 mic and still get a great-sounding acoustic tone. With any microphone you decide to go with, you'll have to experiment with placement techniques. Personally, I've had very good results recording acoustic guitars using the AKG C1000S, which I like to angle downward toward the fretboard side of the hole. Keep in mind that you may have to make some minor adjustments, depending on the size of the guitar body and your finger style. I've been recording professionally for 17 years, and I am always trying to find new ways of achieving a great-sounding guitar tone. Just recently, I discovered a cool way to achieve stereo imaging by miking a single cabinet with two mics. First, close-mike one speaker between the cone and the edge with a Beyer M160 and far-mike the amp using a Neumann TLM 49 about five feet back, pointing the 49 directly at the Marshall insignia on the cabinet. My baby is a Trident 32-channel mixing console, in which I use one of the mic pres for the Neumann and use the Universal Audio 610 for the M160. I buss them both to tape or Pro Tools and hard pan one left and one right. I've always found that experimenting with different mics and amps in combination with your guitar style can really produce that hot buttah tone! Precisionsound releases Nordic Psalmodikon Sample Library - Get 10% off! Breakbeats 1 MIDI Drum Loop Library from Groove Monkee - Get 10% off! Shuffle Drum Beats: Shuffle City from Drums On Demand - Get 10% off! 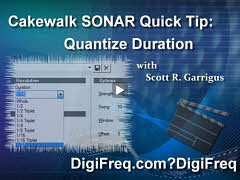 Scott Garrigus demonstrates how to use clock ticks in the Cakewalk SONAR Quantize dialog box to quantize to values smaller than 32nd notes. 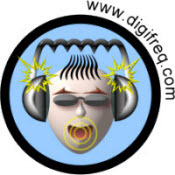 DFreqFINISH - Sign Up for the DigiFreq Forums, Today! Yes, I know... you probably already have a favorite forum at which to hang out on a regular basis, but the DigiFreq Forums are special. They are open, friendly, and free.